"A sweet, warm breakfast idea. Cooked like a grilled cheese, but filled with melted peanut butter and warm bananas." Heat a skillet or griddle over medium heat, and coat with cooking spray. Spread 1 tablespoon of peanut butter onto one side of each slice of bread. Place banana slices onto the peanut buttered side of one slice, top with the other slice and press together firmly. Fry the sandwich until golden brown on each side, about 2 minutes per side. 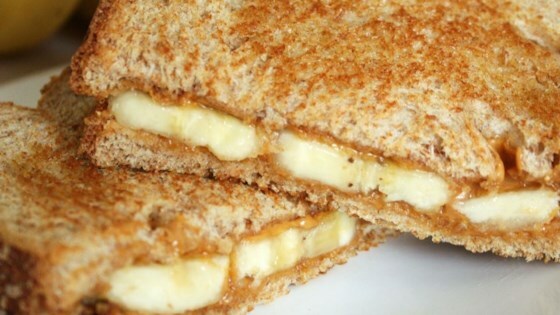 Make a grilled sandwich with gooey melted peanut butter and sweet sliced bananas. Edible but not too tasty - I used a chunky peanut butter that had a lot of oil in it, but the sandwich was very dry. I wouldn't make it again. We love these grilled in margarine then rolled in cinammon and sugar! Yum! Just like Josey said, serve open-faced... with just two little changes. First, don't make this into a sandwich, but rather into French Toast! Second be sure to use plenty of maple syrup. I often make mine in the "Snackster," or sandwich maker. You can just put it in and forget about it and it comes out perfect every time!